How does air become dry and what affects it? Air itself consists of a variety of gases, one of which is water vapour. The amount of water vapour in the air determines the humidity. 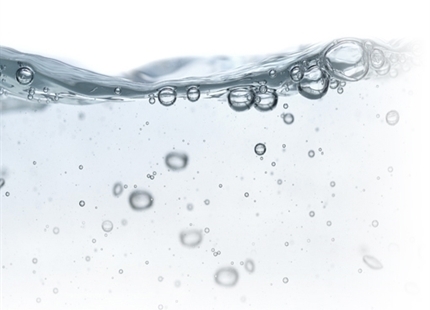 The definition of absolute humidity is the total amount of water contained as gas in one kilogram of air, e.g. 8 g/kg. Important for the ratio of air and water is the continuous tendency of air to absorb water as vapour until it is saturated. A different value is therefore decisively important for the evaluation of a room's humidity and the definition of the optimal humidity value: Relative humidity! Relative humidity describes the amount of water contained in the air compared to the maximum possible amount of water that can be absorbed. 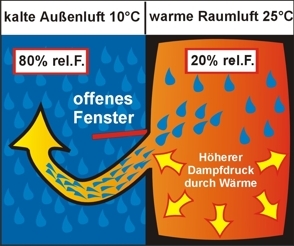 This "saturation percentage" of water vapour in the air is affected by the air temperature: Warm air can absorb a larger amount of water than cold air. The absolute humidity describes the total amount of water that is contained in a certain amount of air in the form of water vapour. Relative humidity is the ratio of absolute humidity and the maximum possible moisture at 100 percent saturation and at the same temperature. 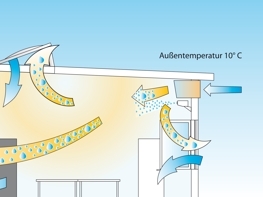 The following example explains the relationship between temperature and relative humidity: If the room has an air-tight seal to the outside, a constant absolute humidity can be maintained: Water cannot be absorbed from the environment, nor can it be given off. Should the inside temperature increase by heating the room with the same absolute humidity, the relative humidity will sink, because the heated air could absorb more air than the closed off room may have available. When windows or doors are opened in the winter for ventilation, the inside air will be even dryer than before. Because of the increased vapour pressure of the warm, dry inside air, the remaining residual moisture will escape to the outside. The relative humidity will sink further. This explains why, especially in winter, the air is so extremely dry if it is not being actively humidified. Windows in rooms that are not part of a central ventilation system should only be opened briefly but widely (shock ventilation), especially in the winter months. The optimum room temperature is between 20° - 22°C. Regularly measuring relative humidity using a hygrometer is very useful. The recommended humidity in living and working spaces is between 40 to 60 percent (at a room temperature of 20°C). If the air is below the desired or necessary relative humidity for an extended period of time, the installation of added air humidification systems should be considered. Nozzle systems for direct air humidification can also easily be retrofitted into older buildings. The certification of "Optimised air humidification" issued by the DGUV can be a great aid in selecting the appropriate air humidification system. 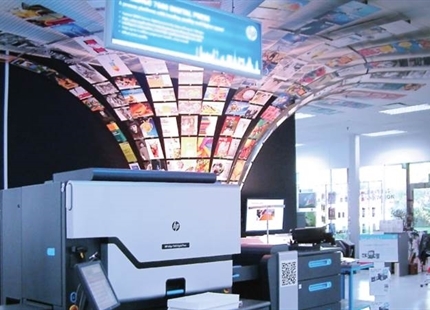 Furthermore, the manufacturers should be able to proof the state of the art in accordance with VDI 6022 Sheet 6 and offer a corresponding on-site certification of the systems installed. If a ventilation system is installed, fresh outside air is continually taken in, filtered, tempered and fed into the respective room. The stale air is extracted out of the room and exhausted. This way fresh air flows through the room continuously. (See figure on left). When you open windows or skylights, the balance of the entire ventilation system will be upset. The desired humidity levels cannot be reached combined with a direct air humidification system. Cold air is lighter than warm air and therefore sinks to the ground. The consequence is unpleasant draft sensations at work. In addition, the increased heat pressure pushes the air, fed in through the ventilation system, then tempered and humidified, on to the outside. Part of the fed in humidity therefore escapes permanently, even before it had a chance to sufficiently distribute throughout the room. The desired optimum humidity values cannot be reached. The result is that the air humidification system is constantly activated in the attempt to reach the set values. A direct room air humidification system achieves the optimal results when windows and skylight are not permanently open (brief shock ventilation instead of ongoing ventilation).